Audacy 0 is a 3U CubeSat built by Clyde Space as a pathfinder for the planned Audacy commercial data relay satellite constellation. 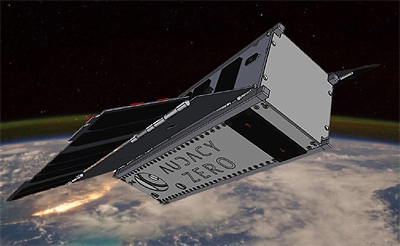 The Audacy 0 cubesat is to demonstration mission to test out Audacy’s user communications terminal and first ground station in the San Francisco Bay Area. Audacy 0 will utilize a prototype communications terminal operating in the K and Ka bands with a high gain and a low gain antenna. Primary data transmission will focus on telemetry, tracking, and command (TT&C) from the communications terminal and subsystems to maintain successful operations and analysis of the terminal hardware. Payload data includes pictures and videos taken from an on-board camera and occasional transmissions from a secondary optical communications payload. As a secondary payload the cubesat carries Stanford's Polar Orbiting INfrared Tracking Receiver (POINTR), an in flight demonstration of an optical receiver pointing, acquisition and tracking (PAT) system. The optical receiver payload would be pointed to the ground to acquire and track a beacon laser sent from a suitable ground facility, currently proposed as NASA JPL’s OCTL facility.